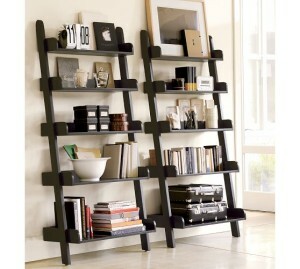 A few weeks ago, I shared our process of making leaning bookshelves inspired by ones featured in Pottery Barn. 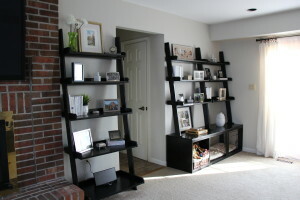 As promised, here are some pictures showing how they came together in our family room. We don’t love the red brick as it makes the room darker and a little dated…not to mention the gold trim around it. When we first moved into our house it felt a little empty for the first few months. We went from a two bedroom (1000 sq. ft) apartment to almost 3x that, so you can imagine we didn’t have nearly enough furniture and decor to fill it. We have enjoyed the process of decorating and settling in over the years. One room that had always been a challenge was our family room. Because of its long, awkward shape, we didn’t know how to make it feel pulled together.